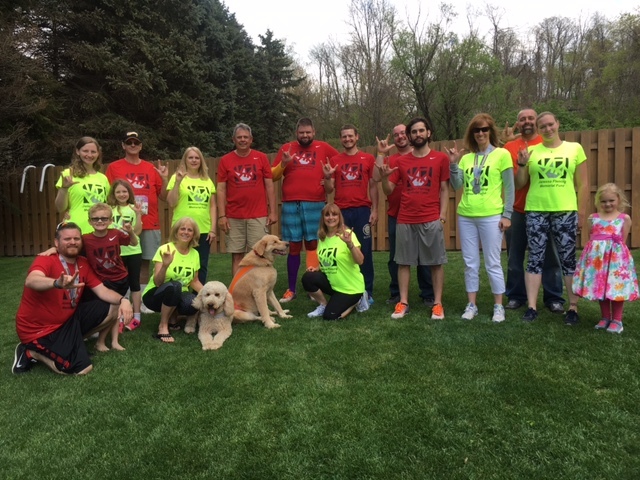 The Just Do It 4 Janessa relay teams, half-marathon and marathon runners ran in the Pittsburgh Marathon on May 1, 2016. This year, we had two Kids of Steel runners. Eight year old Ella Fleming and Six year old Callahan Fleming ran on April 30, 2016. Two dogs, Abby & Diogee, walked in the PetWalk. Again the participants ran in memory of Janessa and also her father, Randy Fleming. This event raised money through sponsorships for the Janessa Fleming Memorial Fund. Back Row: Shirley Fleming, Mark Diffendal, Barbara Wodowski, Frank Smithula, Michael Smithula, Dustin Fleming, Zach Strohm, and Chad Fleming. Missing from photo: Lisa Rearick, Brian Irwin, Kelly Irwin, Maggie Patterson, Lindsey Vrabel, Matt Allison, Trisha Helman, Dottie Pollack, and Dustin Niehenke.